To convert Sony camera recordings to play on iPad 3 on Mac, it is highly recommended to use Pavtube HD Video Converter for Mac. This program works well as a Sony recordings to iPad 3 converter, featuring full support for Sony Camera recordings in different file types. With this little tool, you can transcode camera videos shot by Sony Handycam HDR-PJ710V/PJ580V/PJ760V, Sony Cyber-shot DSC-HX200V camera, Sony CX730/CX740/CX760, and more to optimal files that suitable for playback on iPad 3. 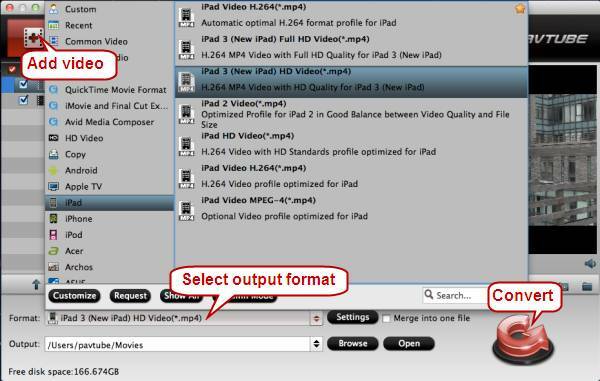 The following guide shows the basic steps on how to transfer Sony camera recordings to iPad 3 on Mac. 1. 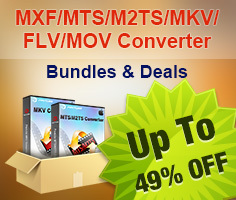 Run HD Video Converter for Mac as the best Sony camera video converter for Mac. Click “Add video” tab to load your source video files taken by a Sony camera. This app comes with two optimized format presets for iPad 3, one with 1080p quality and the other with 720p quality. You can choose either of them as output format from “iPad” catalogue basing on your own requirements. Notice that the 1080p file will take larger space than 720p file.